How clean are your frames? 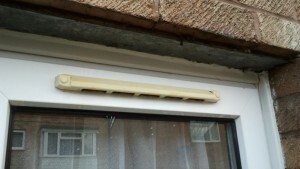 Keeping your window frames clean is really important if you want the best out of your monthly window cleaning program. DMC Window Cleaning clean your uPVC plastic frames each time we visit because not only does it enhance the look of your property, but doing so will keep your windows cleaner for longer! 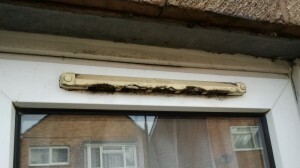 Just look at the difference it makes on these example photo’s taken recently in Droitwich of windows on a property that had been cleaned traditionally in the past, but are now cleaned using a water fed pole system utilising pure water by DMC Window cleaning. The dirt surrounding the frame not only spoils the look of the window but will actually affect how long the glass would stay clean. The majority of traditional window cleaners would only clean your frames if you ask them to and would have to charge a premium price due to the time it would take to achieve a satisfactory finish. There is no comparison to the finish obtained using the water fed pole system and pure water on frames like these just look at those vents at the top of the frame, what a difference! This is not a one off event they will look like this every time the windows are cleaned. If you have your windows cleaned traditionally just using a squeegee blade and detergent would your frames look as good as these? Interested in a free no obligation demo on your windows to see the difference it makes? Then please call DMC window cleaning based in Droitwich on 07545 149197 to find out how to enhance your property.